I haven't bought very many books lately. I just looked back and I haven't done one of these posts in two months and today I only have six books to show you. Six books in two months is a pathetic showing for someone who claims to love books as much as I do. I really need to up my book buying game for the sake of my blog. The problem is that my kids keep outgrowing their clothes so all my possible spare cash goes on replacing the barely worn clothes they can no longer fit into. Please tell me that a 6'1" sixteen-year-old with size thirteen feet will eventually stop growing. Please. And my 11-year-old just passed a practically unworn pair of Converse down to me. To me. Think about that. I just got hand-me-down shoes from my own daughter. I bought a few books anyway. Just think, I saved myself money because my daughter gave me her outgrown Converse. Don't examine the logic of that statement too closely just nod approvingly and move on. First of all, I bought Strong Poison by Dorothy Sayers. I have read it five million times but for some reason I don't own it which is a crime because Pete Wimsey and Harriet Vane make me happy. It showed up in the mail last week. I promptly read it and am now in the process of binge reading all the books that involve both of them. At one point Harriet tells Peter that "If anyone ever marries you, it will be for the pleasure of hearing you talk piffle." I do enjoy listening to him talk piffle as well. I bought a Persephone book, used I must admit, and the sight of its pretty grey cover makes me happy. I bought Bricks and Mortar by Helen Ashton. I recently read The Half-Crown House by the same author and thoroughly enjoyed it so when I saw this on Abebooks for next to nothing I snapped it up. The View From the Corner Shop by Kathleen Hey is the diary of a Yorkshire shop assistant during WWII. My love of wartime diaries is well documented on this blog and when I read a review of this on From My Mental Library I knew I had to buy it. My shelves are groaning under the weight of books about life in Britain during the war but I just keep buying more. I am not sure why I find it so fascinating but I do. I also have a sneaking wish that I could dress like it was the 1940s. The next book I also purchased because of a review I read on a blog. Blog reading has a lot to answer for in my book buying addiction. Lyn at I Prefer Reading reviewed The Past is Myself by Christabel Bielenberg. This is also about WWII but it is a totally different perspective. Christabel Bielenberg married a German lawyer and lived through the war in Germany. It sounds fascinating and I thought I probably needed a more well-rounded picture of the war. The last two books are both by A. N. Wilson. I read and reviewed Victoria: A Life by the same author and was very interested in woman and a time period I had never read that much about previously. I ended up wanting to know more about what life was like during that time so I bought The Victorians and After the Victorians. I have a real interest in the minutiae of life during different times. I am hoping these books will provide that kind of detail. As a side note, if anyone can tell me how to get those stickers off that Thriftbooks puts on their books I will be eternally grateful. They either leave a sticky residue behind of they won't come off at all. It is very annoying. First of all, I LOVE that winking owl thingy. Too cute. Secondly, it's actually adorable that you're getting hand-me-down sneakers from your own kid. Third, *sometimes* acetone-based nail polish remover works to get the residue from those stickers off -- but I don't recommend using it on delicate paperbacks, because it will mess up the cover. The owl is actually a bank though I am not totally sure how you get the money out after you put it in. I'll try the nail polish remover. I get so annoyed by those stickers, especially when I am trying to take photos. I volunteer in a charity bookshop, and we use baby wipes to get rid of residue. It works almost every time. I love A Tree Grows in Brooklyn. My mother gave it to me when I was about twelve and I have read it over and over since then. I'll try the baby wipes. What a good idea. Baby wipes for the win! I use those too. Ohh I love this post! In Hawaii, there are a bunch of library bookstores where people donate books and then the libraries sell them for .25 or .50. So I like to get a lot of my new books from there! But I recently went to a bookstore to get Homegoing because my book club is reading it this month and the library wait list was too long. I also bought Station Eleven, which I originally borrowed from the library but loved it so much I wanted to buy it to re-read. I love those library book stores, you can find some great books for next to nothing. I hadn't heard of Homegoing. I looked it up and it gets fantastic reviews. Maybe you will post a review when you have finished it? I have always wanted to belong to a book club but most of my friends are not big readers. I tried to get one started a year or so ago but it fizzled out before it even began. I also love books based around WW2. I blame my mother who lived through it all and still talked about it constantly. I love Sayers too and have all her books. I bought a vintage crime by Youngman Carter in St Andrews yesterday, he was Margery Allingham's husband. I own most of the Sayers book and have never been in a hurry to buy the rest. I would just borrow them from the library when I wanted to read them. However, the library keeps getting rid of books I love so I thought I had better start filling in the gaps in my various book collections. I don't think I have ever read anything by Youngman Carter. I do like Margery Allingham though. 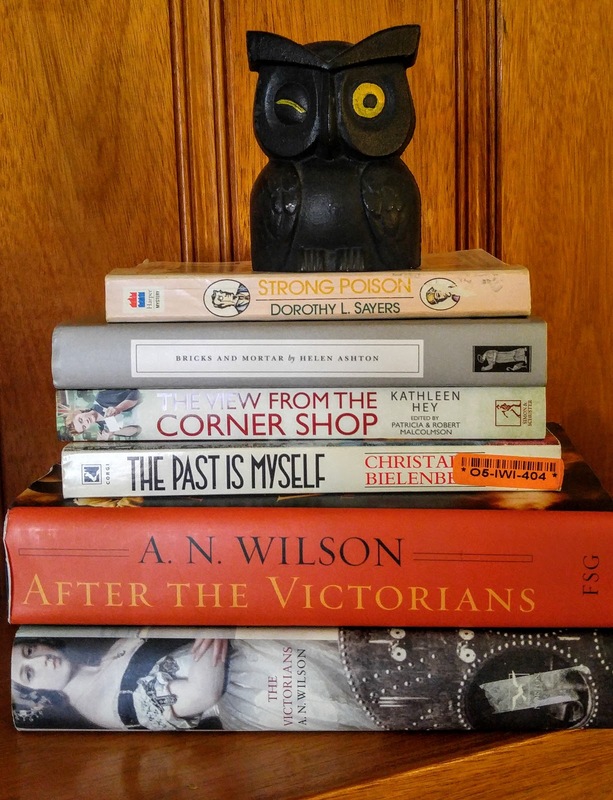 I've tried two Lord Peter Wimsey books and didn't enjoy either, however my blogging friend Alex tells me I managed to read the two worst ones! So, which would you recommend I start afresh with? I bought a used copy of "Montana Rides!" by Evan Evans recently because I love the movie "Branded" that is based on it. Haven't read it yet, though. I also bought a copy of "Dear Mr. Knightley" by Katherine Reay for a friend because she just had a baby and was talking about wishing she had new things to read but never knows what to get from the library or a bookstore. I really liked it, so hoping she does too. I also bought myself "Mary Russell's War" by Laurie R. King, but haven't started it yet. I think that's about all I've bought since August -- I'm trying to work through some of my TBR shelves, as I have a whole bookcase filled to overflowing with books I haven't read yet, so I need to quit spending money on new books and read some of the ones I already have. So I'm trying to limit myself to one book a month until after Christmas. It's tough. One book a month is tough. I admire your attempt! I haven't read Mary Russell's War yet but I want to. I checked the library for it but they don't have it. I was a bit disappointed in the last few books in the series so haven't been in a rush to read it but then I read a review recommending it and saying it was one of the better ones. I've read some of the stories in it already because she released them for e-book over the last few years. I really liked the one about Russell and Holmes' wedding, and some of the others were enjoyable too. "The Murder of Mary Russell" was very good, I thought -- much better than the previous several.